For the 3rd time this summer the rain forced a cancellation of a night of racing for the IMCA Modifiedes Saturday night at Saratoga Speedway and in doing so their 2017 points championship was clinched. Oyster River’s Chris Beaulieu who won his first points championship back in 2002 in a Bomber car tied his uncle Martin Beaulieu for the most championships won at the Black Creek oval with 6 as his 225 point lead over Travis Stevenson is untouchable. Beaulieu besides wins in 2002 and 2017 won championships in Modifiedes in 2006, 2007, 2010, 2014 and 2015. The Saturday night racing program was to feature along with the Modifiedes the Bomber and Dwarf cars along with the Road Runners leaving the 2017 season with only 3 race dates remaining including the championship race night for the Mods and Bombers September 23rd with season ending race September 30th. 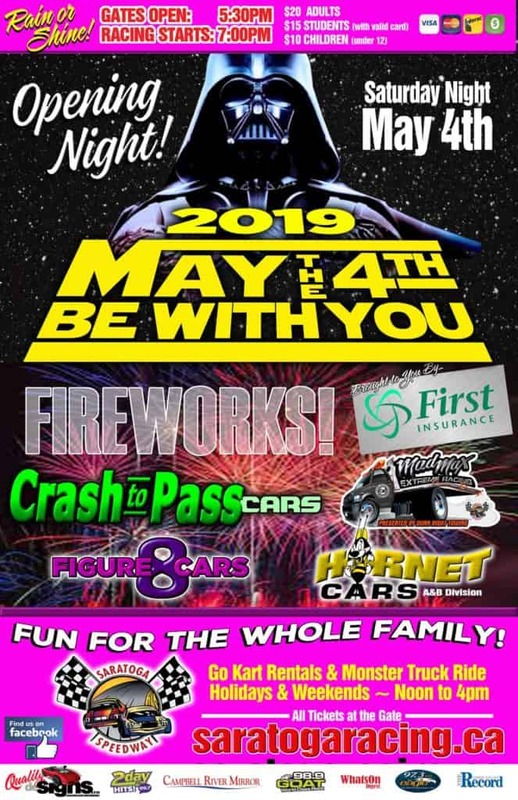 This Saturday night will feature the 2nd last race for Hornet’s,Mad Max,Crash to Pass while the Road Runners also part of the program have 3 races remaining; Three of the four point battles look to like they will need all the remaining races to decide point champions with only the Hornet A’s point battle not close enough to change over the remaining races. The tightest battle is in the Hornet B division as 5 drivers have a chance for a championship season as only 90 points separate the top five drivers led by Randi Joyce who has a 52 point lead on Jimmy Antonik followed by James Laidlaw, Evin McLuckie and Taylor Pheaton. The Hornet A’s have Carter Hintz leading 2nd place Luke Dixon by 245 points a difference that could clinch the championship after Saturdays racing. The remaining top 5 drivers are Glen White ,Darren Monk and Ashley White. The Mad Max division is down to 2 cars as Danielle Antnoik holds a 26 point lead on defending point champion Damon Dunn while 2 straight main event wins has put Brad Dimitrov solidly in 3rd however the 282 point difference has him out of the championship battle. A missed race night on September 3rd has changed up the points race with the Crash To Pass division as Troy Ordano has taken over top spot but has 4 other drivers breathing down his back as only 71 points separate him from Chris Campbell, Rich Hutton and Mike Jenkins while Scott McLellan has a outside chance being only 138 behind. The Road Runner division with 3 races remaining go into the weekend with 2 time defending point champion Ryan Guest leading the way only 67 points ahead of Austen Hack who lead the points race over the first half of the season while 3rd place Garrett Ann Rosner sits 282 points back. The season’s final race of the season September 30th will include a giant fireworks show will run rain or shine and will feature the Hornet cars, Mad Max, Crash to Pass and the Road Runners along with the seasons final race the annual speedway Great Pumpkin race.